New iGoogle Artist Themes Are Out! Today is one of those days where I've done a lot of wishing for things, like being in San Diego with my parents for the San Diego Chargers vs. New York Jets game (my dad just sent me a picture text of the field). That isn't happening at any point in this day of mine, and neither is getting any one of the following, but hey, a girl can dream, right? 1. 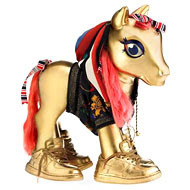 New York graff artist Claw Money was one of 25 guest designers who created a limited-edition My Little Pony for the company's 25th anniversary. She decked hers out in a signature Claw Money silk scarf jackets and gold Nike Vandals -- two pairs for four pony legs, obviously. Can of spray paint is not included, unfortunately, but this My Little Pony is, well, money, nonetheless. 2. Damn, son! Forget about getting a pretty pink bike cruiser for next summer. 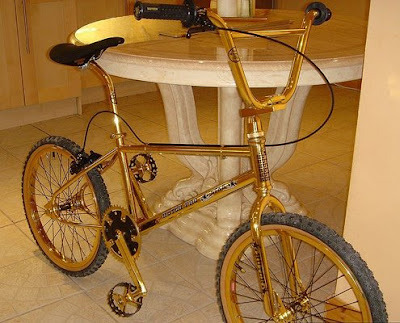 This 24-karat gold Hutch Prostar BMX bike from Goldstriker. It'll match all my costume jewelry at least. 3. 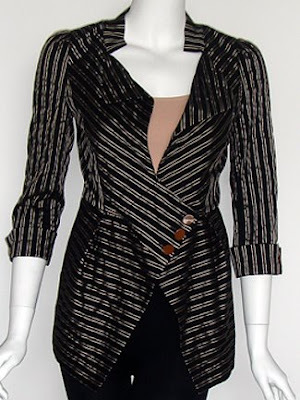 This striped jacket from McGinn. It's like Cabaret, the Godfather and Elizabeth & James all rolled into one. 4. 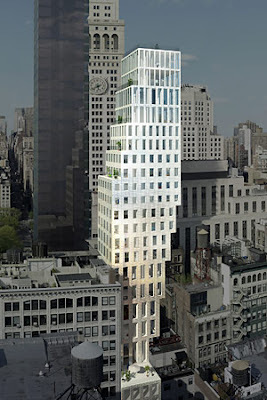 He designed the mega-cool Prada flagship store in New York, and now he's building a freestanding, "swerving", 24-story apartment tower in the same city overlooking Madison Square Park. Rem Koolhaas is one of the greatest modern urban architects of our time. He apparently has a great sense of humor, too, because he laughed when asked how much one of the penthouses goes for in the $120 million building. 5. Ooooooo. Emilie de Ravin, who plays Claire in Lost, showed up to the Emmys last night in this very, very pretty dress from Matthew Williamson. I like. It's rather necessary to tally up just how much these five items would set me back, even if I actually had the dough to drop on them, but it's definitely more than two months rent. Yikes. Veuve Clicquot tastes, Pabst budget. I'm Lovin' it: Rainy Saturday afternoons reading at coffee shops. Just as long as with you're with someone who ends up making a tasty chicken cacciatore pasta dish for dinner with baguettes and red wine, followed by a bowl of Island Farm coconut ice cream (my new favorite flavor). I love food! Oh yes, this Marc by Marc Jacobs outfit is just about as equivalent in the covetable department, only I can't eat any of the latter if I want to fit in the ensemble without Spanx on. I'm Over it: Thinking of a baby gift to get my roomie's new nephew. I'm just not in baby mode at this point in my life, so I'm pretty sure I'm just afraid to dip a toe in my neighborhood Babies 'R' Us. Track of the Day: There was this amazing Hed Kandi remix of a familiar song that GD had playing on his iTunes this weekend, but I just completely blanked. I'll have to use my investigative powers -- or my phone dialing powers -- to find out its name for y'all. In the meantime, here's another artist he discovered: Jamie T. Enjoy the Brit's half-rap, half-indie pop track "So Lonely Was The Ballad". The quality is bit low in this video, so I suggest downloading it off iTunes when you can.